Who will win the Conservative Party leadership election on 9 September? Andrea Leadsom. Any further questions? We can ignore the result of the vote of the Parliamentary party May (60.5%), Leadsom (25.5%). It has no real connection with the way the base will vote. In fact, the grassroots vote may be the inverse of the parliamentary vote. We noted elsewhere how the Remain majority among MPs could be interpreted as coming from those MPs who were elected as part of the process of central control of candidates that first took effect during the preparations for the 2010 election. However, in the present leadership election there is no central control over the candidates, apart from May being the establishment candidate. All evidence suggests that the current disconnect between the grassroots and the newer MPs is appreciable and that an 'establishment' candidate will have no advantage at all. Leadsom is a break with the past. The grassroots will want that. All the anecdotal evidence points to simmering discontent in the ranks. Leadsom is largely untainted by the Tory past, she is baggage free and was a referendum Leaver. She is being positive and cheerful in a way that would be quite worthy of Ronald Reagan. She has carried herself well. She looks like a leader. Leadsom has suffered a little damage in recent days but seems to have floated above it. With papers such as the Daily Mail supporting May and thus out to get Leadsom we can expect that there will be a steady flow of negative reporting of her – 'It's a rough old trade, politics', as Alan Watkins frequently wrote in his column – but we assume this will be trivia. Why will it be trivia? Because if it's really bad, disqualificatory, then the entire pre-selection process by MPs was fatally flawed and the Tories will have an interesting crisis on their hands. The worst thing that can happen to the Tory party at the moment is the emergence of something really bad about Leadsom. Putting a candidate forward for the vote of the grassroots is a stamp of approval, a nihil obstat. If 25.5% of the Tory MPs have voted for her and she turns out to be a flake or otherwise dubious person, then those MPs are going to be made to look very stupid. In contrast, May is surrounded by skeletons, most of which are not even hidden in cupboards but strewn across the floor and propped up in corners and alcoves, with the odd skull acting as a paperweight on her desk. 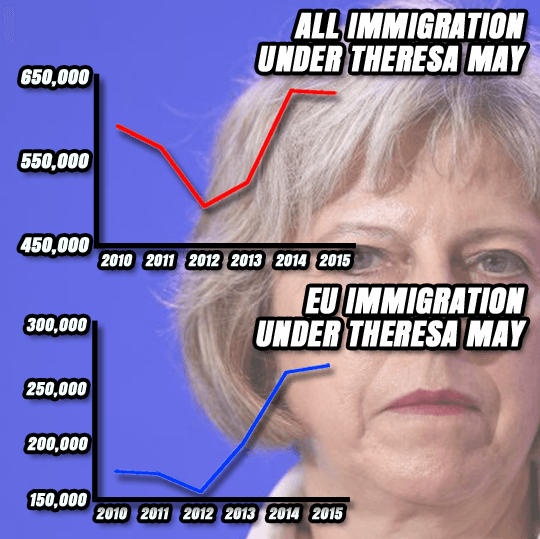 Her stewardship of the Home Office over the past six years has not been a smooth ride at all. She really only needs to be pressed on her inability to control immigration coupled with her choice of Remain in the referendum. Simply having called her opponents in the Tory ranks the 'nasty party' should have ruled her out on its own. Taking her down will be easy. In short, as far as the grassroots are concerned, May has nothing to gain and everything to lose. For those reasons: Andrea Leadsom. Even the Guardian gets it. Conservative MPs will get a “wake-up call” from party members when they discover the extent of support for Andrea Leadsom, the head of the voluntary party has said. The news came as it emerged that the Tory party’s membership has swelled in size since David Cameron quit, with 10,000 new members joining in the four days after his resignation. Steve Bell, the president of the Conservative Party’s National Convention which represents the party’s voluntary associations, said he was “expecting” Mrs Leadsom to win. Mrs Leadsom is regarded as having political views on issues such as gay marriage, HS2 and fox hunting that are more in tune with the party's membership than Mrs May. A poll published by Leave.EU, one of the pro-Brexit campaigns which is backing Mrs Leadsom, of 5,000 Tory members on Thursday found that 56 percent supported Mrs May against 44 percent for Mrs Leadsom. This is at odds with the Conservative parliamentary party, with six in 10 MPs backing her in the final leadership vote, against just one in four for Mrs Leadsom. It's started. A story artfully placed in all the major news outlets. We hope she was making her own recording of the interview – if not, we hope she learns the lesson: they really are out to get her. Last night, Mrs Leadsom furiously denied the toxic comments attributed to her. ‘This is despicable and hateful reporting. You must now provide the transcript - this is beyond disgusting. And it continues. The May camp must be really worried about something… their own candidate's weaknesses, perhaps? Mail: Senior Tory women spearhead backlash against Andrea Leadsom over motherhood jibe at rival Theresa May amid warnings the party could SPLIT whoever wins. Telegraph: Tory women turn against Andrea Leadsom as motherhood row deepens. Project Fear™ gives way to Project Smear™. Let's see if that works. Not for sensitive stomachs – only two more months of this to go! James Kirkup in the Telegraph (10 July 2016) The grievances of the Tory scorned may yet decide this leadership vote nails it. Whoever wins this battle – the 'modernisers' or the 'old-guard' – the trench warfare that has been rumbling on in the party since the 1990s will continue. The party may split, fulfilling the long-held wish of Peter Hitchens. Is it too much to expect that Andrea Leadsom would attract many of the now fragmented Ukippers back into the Tory fold? A human interest anecdote to close the Leadsom disaster movie. Many, many years ago, a schoolboy was working on a holiday job in a hospital laundry. His colleagues, an interesting group – it was a psychiatric hospital, after all – introduced him to the joys of betting on horses. Inspired by a modest success or two – so it always goes with gamblers – he placed a complex accumulator bet for £5 on the afternoon's racing at Newmarket. It was clear to everyone that by 4 pm he would have riches beyond the dreams of avarice. By 2:30 pm it was clear to him that he had just lost 50% of that week's wages. His colleagues' attempts at Jobian comfort did not console and he vowed never, EVER to gamble again. That vow was kept down the years and decades – until last Friday. The bookies were offering odds of 3-1 on Andrea Leadsom to become the next Conservative leader. That small voice that he had heard all those years ago whispered: £200 would earn you £600 profit for nothing. It's a cert. He was even debating the point at which he would double up on the stake should the odds lengthen. The plan failed, fool. No online book on this contest would allow a bet to be placed from Switzerland. Bloody Swiss! Always Goody-Two-Shoes – won't let someone have a little flutter on a certainty. Well, today it seems all those years of his kneeling by the bed every night and saying 'lead us not into temptation' paid off. There absolutely must be a God. I wouldn't bet on it though. Norman Tebbit in The Telegraph: Theresa May will drive Tory members into the arms of Ukip. Of course she [Andrea Leadsom] never claimed that being a mother gave her an edge over the childless Mrs May. She merely expressed her natural pride in her family. I suspect that much of the hatred she has suffered arises from her opposition to gay marriage as much as her Euroscepticism. Mrs May is now set to become Ukip’s greatest recruiting sergeant. In recent years, the Tory ranks have shrunk from around 400,000 to something more like 150,000. Bitterly disappointed party members who campaigned successfully for Brexit now fear that the remainers have managed to turn defeat into victory and will join Ukip – alongside sensible Labour voters disgusted with both Mr Corbyn and Ms Eagle alike. These footsoldiers who knock on doors, deliver leaflets and raise money will not just stay at home. They will campaign against Mrs May. Thank God it was not always thus, or we would have had Chamberlain and Halifax, not Churchill, Attlee and Bevin to lead us in 1940. All is not lost. They do things better at Wimbledon. Andy Murray’s victory has not been set aside after he attributed his strength to fatherhood. Generously his childless opponent made no complaint.